A sought-after Los Angeles guitarist, USC Thornton Studio Guitar alumna Molly Miller (BM ’11, DMA ’16) was recently published in Premier Guitar, in the first article of an ongoing series. Her piece, entitled “Dr. Molly’s Guitar Lab: The Badass Riffs of Sister Rosetta Tharpe,” breaks down the compositional patterns behind the “Original Soul Sister’s” distinctive riffs, while providing basic instruction on this style of guitar playing. Miller has recorded and toured with artists such as Jason Mraz and The Black Eyed Peas and has performed at The Hollywood Bowl, Telluride Music Festival and Planeta Atlantida. 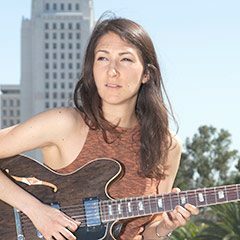 In addition to heading her own trio which is regularly featured on NPR, she is also the Chair of the Guitar Department at Los Angeles College of Music.